For the University of Guyana to truly transform and recognize the potential of Guyana’s youth it will need a lot of finances to make the journey from where it currently is. 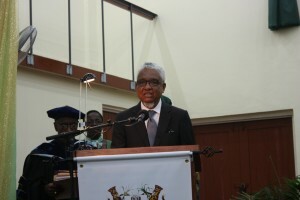 This is according to the newly installed Chancellor of the University Nigel Harris. He made the statement while speaking at his installation ceremony on Wednesday evening. Harris pointed to the emerging shift in the global culture which beckons a time for a new breed of professionals and this is something that UG must be a part of and not merely look on. “It may be partly true that in the last five years we have existed on the periphery, but it is not entirely true and we should not be satisfied with merely being on lookers,” said Professor Harris. He stated that a Task Force established earlier in 2016 has put forward a slew of recommendations to transform the operations of the University. These include better financing, governance reforms, and quality assurance. The task force has called for a comprehensive operational manual which outlines proper procedures for all aspects of the University’s operations. Harris said that UG is moving swiftly towards implementation the recommendations. The task force also recommended an increase in UG subventions from the Government of Guyana. “The Taskforce recognized that the University cannot rely solely on government largess – indeed with all the best in the world Government subventions alone cannot enable the transformation UG requires,” he stated. The Chancellor stated that it is imperative that urgent and aggressive measures are taken to implement as many of the recommendations contained within the report. “Without appropriate financing the University cannot achieve the transformation necessary to lift it to a level that will serve our country’s interest in a rapidly evolving world,” stated Professor Harris.